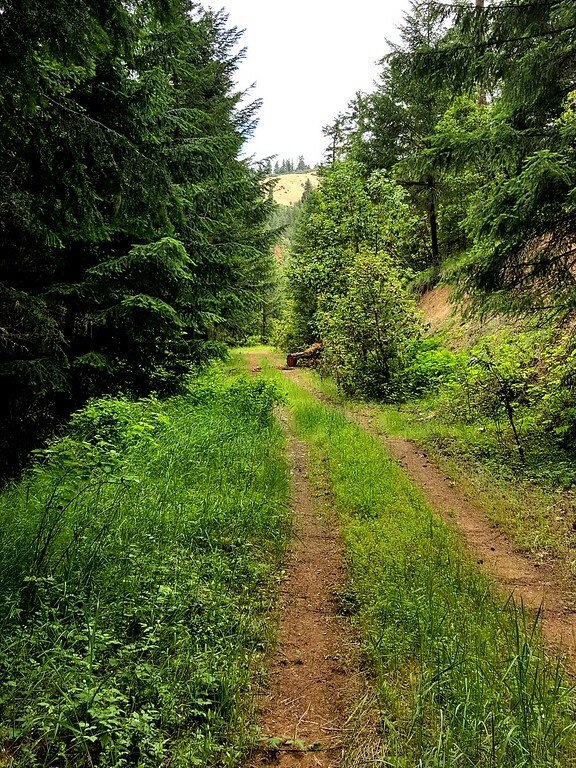 The Sterling Mine Ditch Trail – despite its somewhat industrial name – is one of the most popular and most publicized trails in Southern Oregon. It’s open year-round, is accessible to hikers, mountain bikers, and equestrians, and features wildflowers in the Spring and colorful foliage in the Fall. 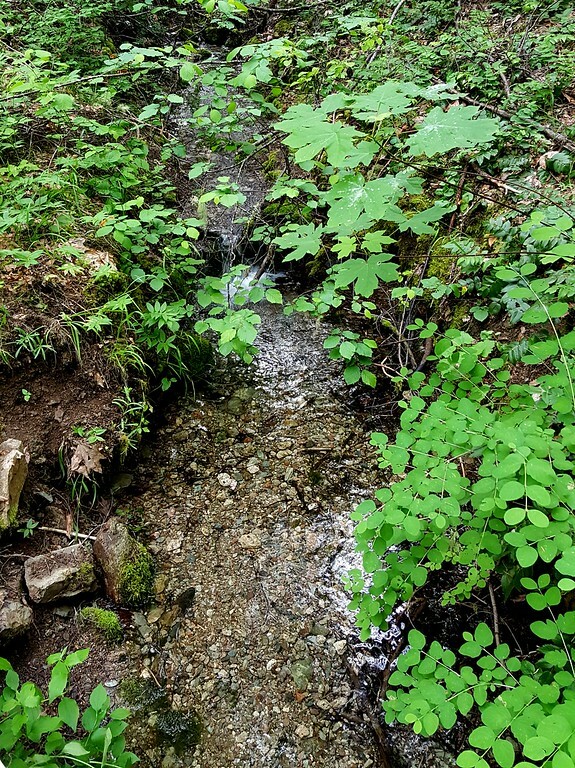 The original 26 mile long “ditch” was constructed by hand in 1877 to convey water from the Little Applegate River to a huge hydraulic mine in the upper reaches of the Sterling Creek drainage. The mine and the town it spawned (Sterlingville) are now gone but the ditch remains. 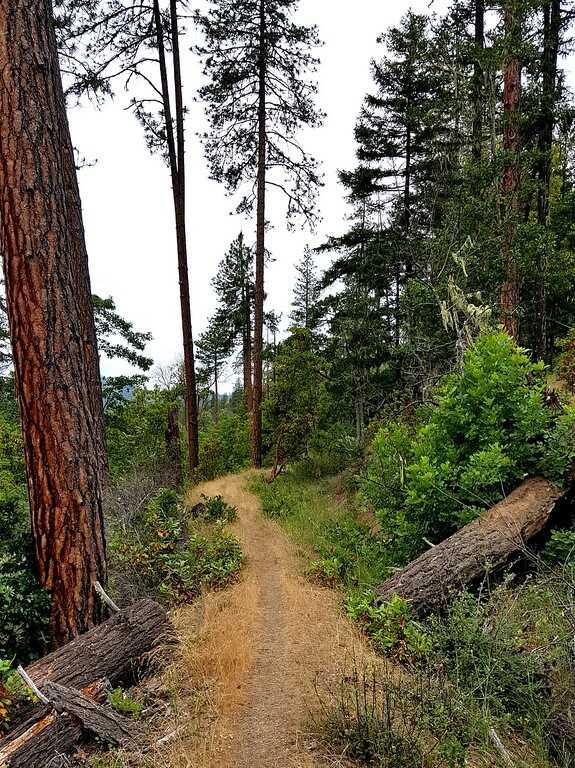 Thanks to the efforts of the Siskiyou Upland Trails Association (SUTA) and the Bureau of Land Management (BLM), 18 miles of the ditch have been reclaimed as a valuable recreational resource. 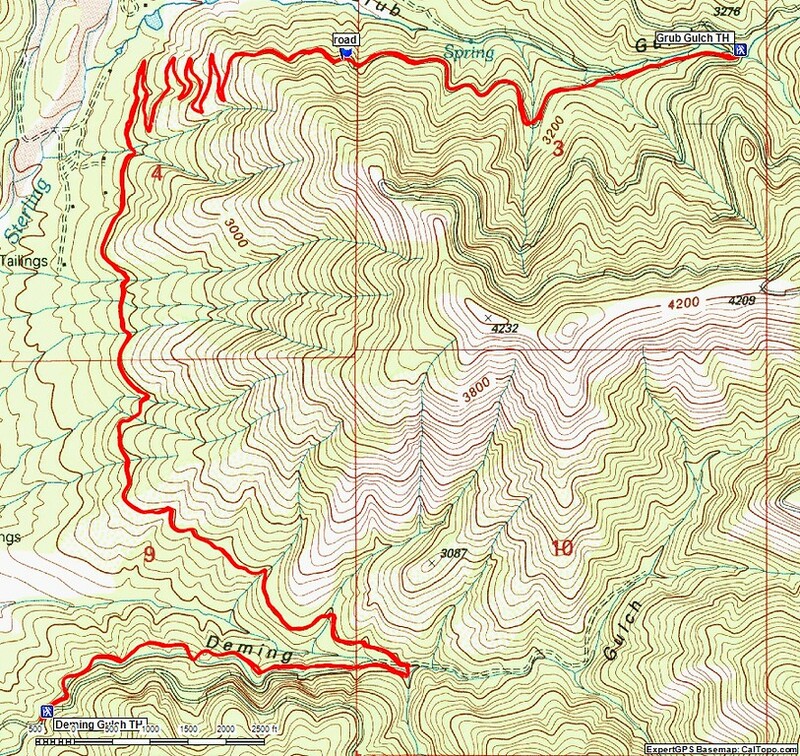 Since 2013, we have been able to hike (more than once) all parts of the trail with one exception: the segment between the Deming Gulch and Grub Gulch Trailheads. Yesterday, I (the LovedOne being too consumed by a backlog of fiber and gardening projects to join me) set out to remedy this omission. The Deming Gulch Trailhead is on the Armstrong-Deming Road (BLM Road 39-2-8) about 15 miles south of Jacksonville, Oregon. From here, the trail heads east, contouring almost level into Deming Gulch – the ditch itself is still clearly visible next to the trail. In under a mile, I crossed the small creek – still running thanks to our wet winter – in the bottom of Deming Gulch. The trail is essentially level (it’s actually very gradually descending) for its first three miles. Along the north side of Deming Gulch, it traverses through lush vegetation and forest but then moves into much drier, more open terrain on the gulch’s south side and beyond. 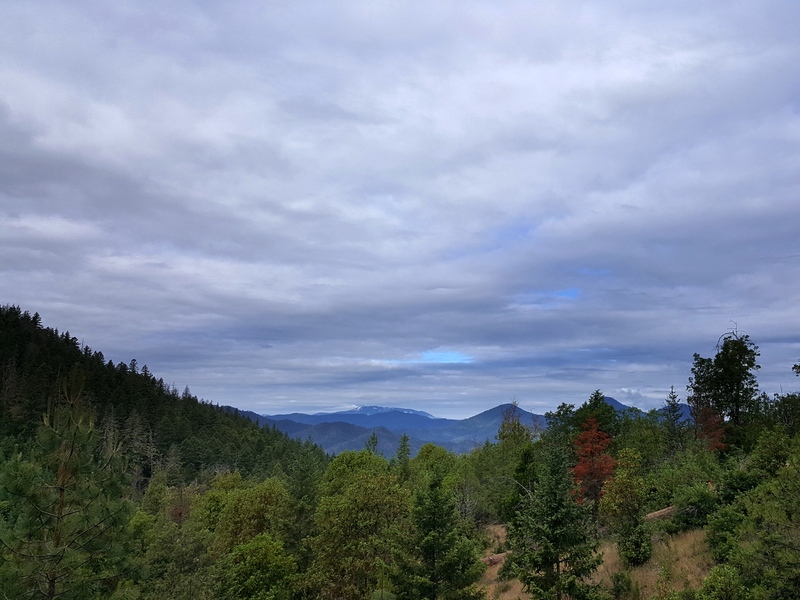 It was a cloudy day, but not a cool one, so conditions were surprisingly muggy for Southern Oregon. I was mostly in the trees along this stretch, but there were a few spots where a view of the west was possible. After three miles, I came to a gate ahead and a sharp turn to the right (east) where the trail starts up the south side of Grub Gulch. 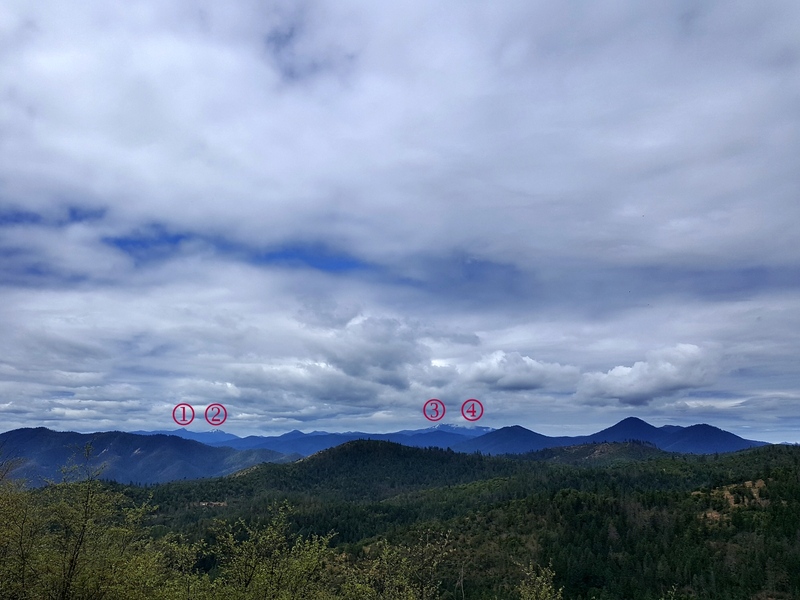 Many of the non-idigenous place names in Southern Oregon trace back to the miners who flocked here in the 1850s and 1860s to “strike it rich” mining for gold – most would be sorely disappointed in this endeavor. In their world, “grub” meant food (not some giant fly larvae) or was short for grubstake (the material, provisions, or money supplied to a miner in return for a share in the resulting profits). Here the ditch itself continues north, on to private land and the former site of the Sterling Mine and the town it spawned, Sterlingville. The mine had its beginnings in 1854, when James Sterling discovered gold southwest of Jacksonville. Early mining activity was a hodgepodge of individual efforts, but in June 1877, mining operations were consolidated into the Sterling Mining Company. During the next fifty years, the company dug the Sterling Mine Ditch and expanded the mine to cover more than 2,000 acres. By 1900, it was the largest hydraulic (placer) mine in Oregon. 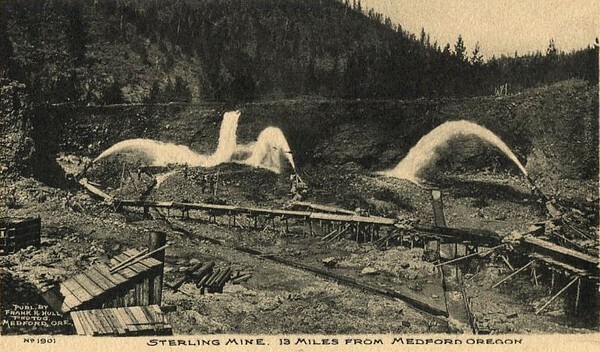 The mine continued to be profitable until World War I, when operating costs began outpacing income from the gold extracted. By World War II, the mining operation had been reduced to one man, who continued to scratch a living from it until the mid-1950s. before connecting with an old road (BLM Road 39-2-3.1) at around 3,000 feet. On the way up, there were some bigger views of the Siskiyou Crest to the west. It was evident that there was still a fair amount of snow along the Siskiyou Crest above 5,000 feet – another consequence of our long, wet winter. 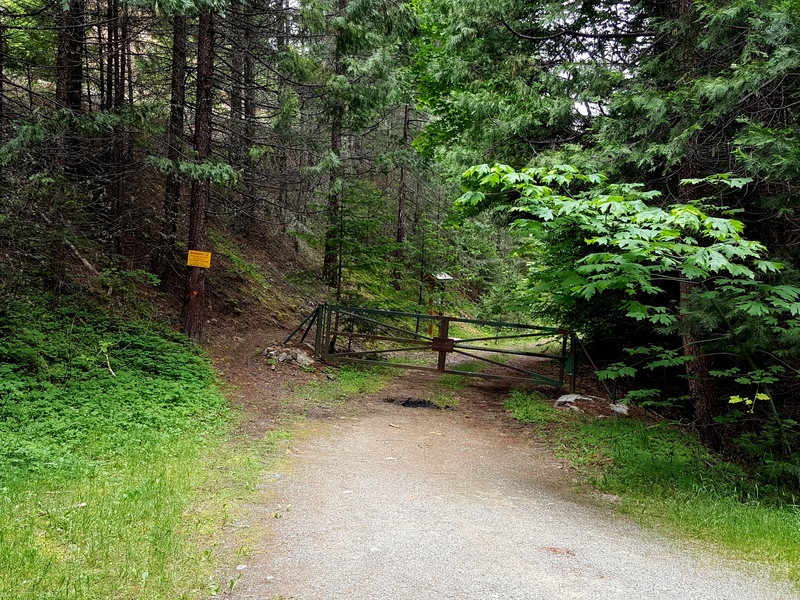 I followed this road up to the Grub Gulch Trailhead on BLM Road 38-2-26 (Grub Gulch Road) – the trailhead sign is on one side of the locked gate; the trailhead kiosk is on the other side. The start of the Hidden Creek Trail is across the road to the east. 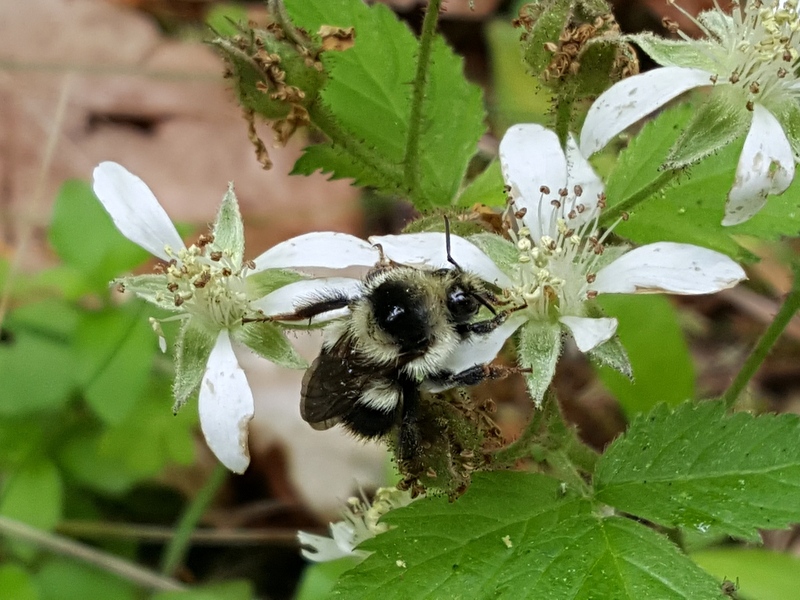 After a snack at the trailhead, I retraced my steps, occasionally stopping to observe some of the small creatures in the forest (as well as juvenile turkeys and a great horned owl). As is often the case, the day managed to find its sunshine when I was crossing Deming Gulch, about a mile from the car. Sigh. 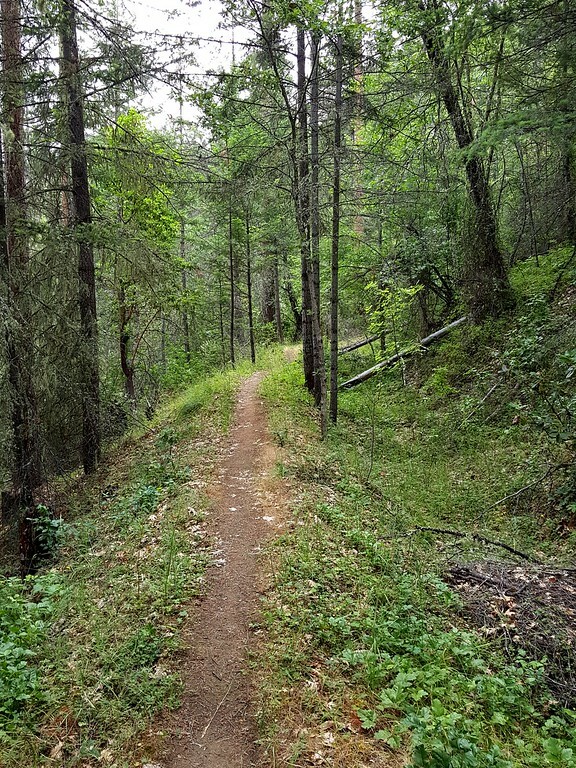 A longish, but generally easy, trail (12.5 miles roundtrip; 700 feet of elevation gain) through different forest habitats and with some views – a great leg-stretch and a good trail to keep in mind for Fall and Winter. 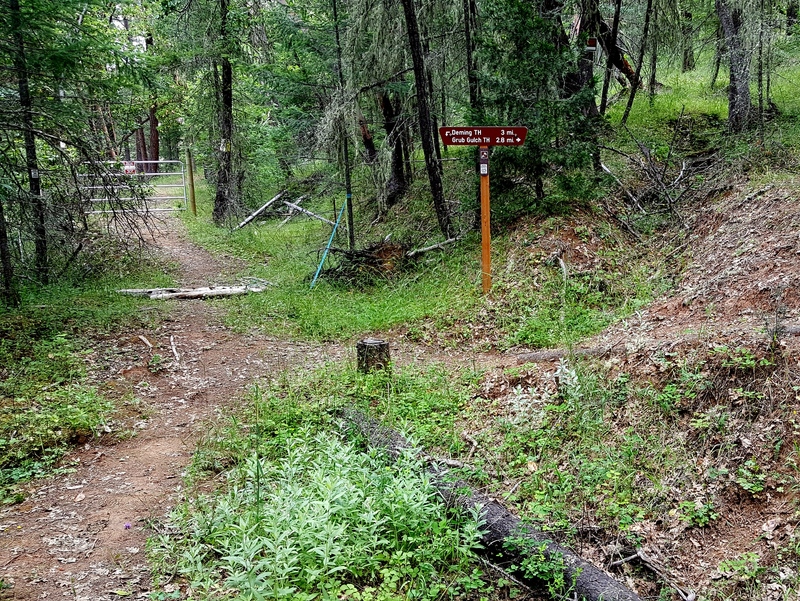 The trail up to the gate seemed reasonably well-used but that up Grub Gulch, not so much. 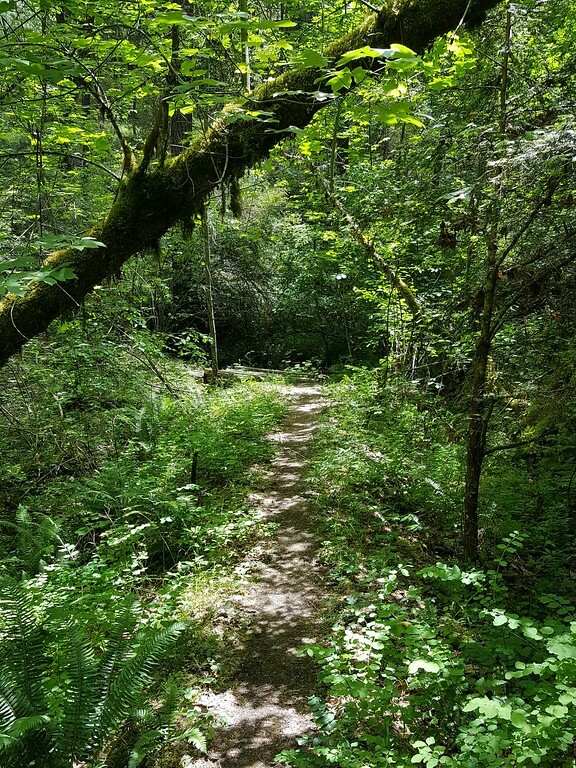 This may be because, at the moment, it’s just an out-and-back trail; however, continuing on up the Hidden Creek Trail would give you an old-growth forest grove as a worthy goal. Mountain bikers and equestrians can make a loop using the Grub Gulch and Armstrong-Deming Roads but this wouldn’t be much fun for hikers. 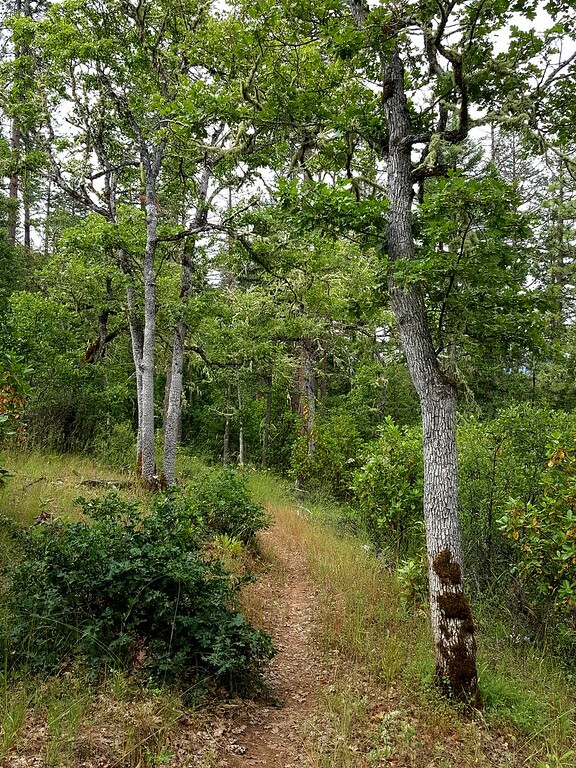 However, when the currently in-progress Jack-Ash Trail is completed, there may be possibilities for more hiker-friendly loops or a challenging hike up Anderson Butte! As an aside, our local paper had a recent article about the horrible mosquito season ahead – again, thanks to that wet winter. Well, maybe so, but the mosquitos today were few in number and seemingly unenthused about biting me. 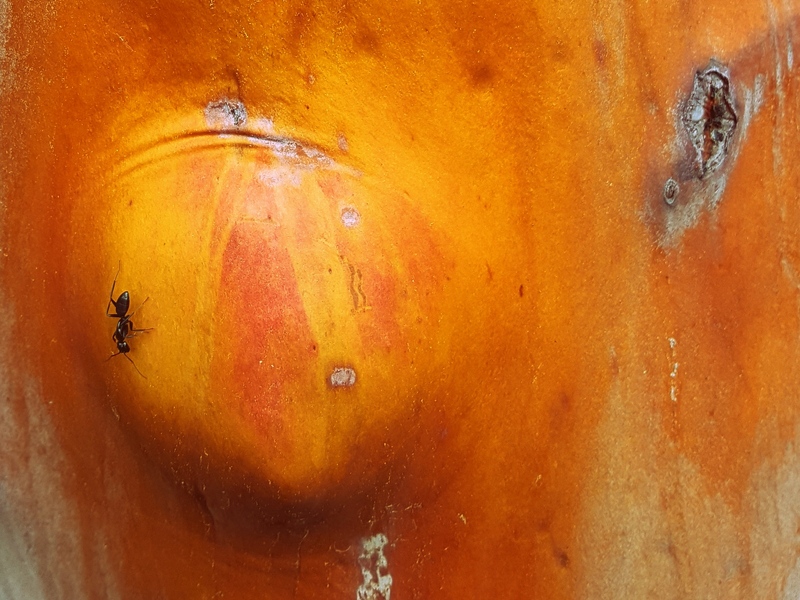 The ticks, however, were numerous, aggressive, and very, very much interested in holing me with their sharp little feeding tubes. One got me inside my sock! So be warned – they’ve already hatched!!! Just an fyi, there is now (as of Sept 2017) a 12 mile loop from Deming TH to Wolf Gap TH and around due to the Jack-Ash completion of phase 1……we are looking at trying that hike in Autumn 2017 or during winter…. Thanks for pointing this out. I was wondering when Phase I would be ready and can now find a map of it on the SUTA website. Great!